Compiz Main Plugins 0.9.7.4 "SRU-1"
1. Run "ccsm" (from the "compizconfig-settings-manager" package). 2. Scroll down to "Window Management" and disable "Snapping Windows". If you quickly drag a window the cursor will start floating off the title bar. If you keep quickly switching desktops via drag (I used a circle type motion), you can get it so far apart that your cursor is on one screen and the folder window is on another. Another way to reproduce this bug is to *quickly* drag a window to the top of the screen and trigger the 'maximise preview transition' followed by moving the mouse downwards without releasing the window. Repeat multiple times without releasing the window to accentuate the effect. I expected the mouse to stay in the same position on the window title bar, not go wandering off. If you let go, window stays where it looks like it is, does not zoom to be under mouse (Which is good I guess). Note there is a related issue when restoring maximised windows by right click holding on the menu bar and dragging downwards. After performing this action the pointer should always be attached to the window title bar, but it currently ends up some distance away. - When dragging a window by the window title bar using a pointer, the pointer should always stay attached to *exactly* the same position of the window title bar. Is this symptom reproducible in 8.10 or 9.04? Sorry for such a long delay. 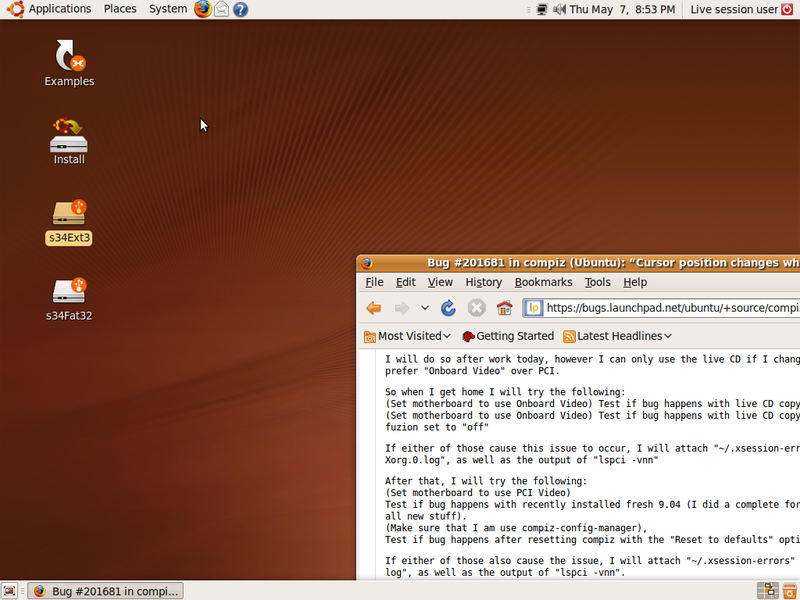 I am currently using Ubuntu 8.10, using the built in compiz-fuzion. I am using a single monitor (Using an Nvidia PCI video card), and have 6 virtual desktops, three screens on three screens. When moving a non-maximized window in a rapid circle motion from one window to another, (Like accross the verticle border or from one window to a side one), really fast in a circle pattern, the mouse will move every so slightly away from where I originally clicked on the window. Repeating the motions moves the mouse farther and farther away. I have wobbly windows on, but the error still occurs when I turn it back off. Is there any info I should include to help out? Someone asked if this was still present in 8.10, and I have checked: The error still occurs with and without wobbly windows. Thank you for taking the time to report this bug and helping to make Ubuntu better. You reported this bug a while ago and there hasn't been any activity in it recently. We were wondering if this is still an issue for you. Can you try with the latest Ubuntu release (maybe live CD)? Thanks in advance. and the output of lspci -vvnn. Also try to see if the bug happens with the default settings. To get the default settings, install "compiz-config-manager", launch it and then go to "Preferences" (left bottom corner) and click on the "Reset to defaults" button. I will do so after work today, however I can only use the live CD if I change my motherboard to prefer "Onboard Video" over PCI. (Set motherboard to use Onboard Video) Test if bug happens with live CD copy of 9.04, with compiz-fuzion set to "off"
If either of those cause this issue to occur, I will attach "~/.xsession-errors" and "/var/log/Xorg.0.log", as well as the output of "lspci -vnn"
Test if bug happens with recently installed fresh 9.04 (I did a complete format recently, so its all new stuff). If either of those also cause the issue, I will attach "~/.xsession-errors" and "/var/log/Xorg.0.log", as well as the output of "lspci -vnn". ^_^ I think I can get this done by 5:00pm on Thursday, May 07, 2009 Central Time, unless something delays me. Ok, On the live CD of 9.04 (For 86 processor), it still does it. I attached a screenshot. In a second I will post the txt commands asked for. So I went to "Applications", and went to "Add - Remove", choose "Select from All", and searched for compiz. After installing "Advanced Desktop Effects Settings (CCSM)", I set it with a 3x3 desktop and wobbly windows, everything else as default, and thats it. If you grab a window and drag it rappidly accross virtual desktops, the cursor will drift off the title bar as described by my original post. Attached is the three files requested, after sending them I will reset Compiz, and test it without 3x3 and wobbly windows. O.O Holy Crud, it happens with default! With two virtual desktops, and no wobbly windows, I can still get the cursor to move off the title bar (I included in the zip file a picture to show how far off I got). To make the cursor drift, all I had to do was drag the window very quickly between the two virutal screens. After about 10 moves, it started to go off to the left of the window as shown. This bug is still reproducable on Oneiric. I haven't tested Precise/bleeding edge versions, though. Confirming this one on Ubuntu 12.04 as of now, with proposed enabled and all current updates applied. Using proprietary nvidia-driver. Grab a window and juggle it around, especially hitting some maximization spots like the top bar or left/right edges, and the cursor can easilly become "detached" from title bar while grabbing/moving. So the mouse cursor visually grabs into thin air while still having a hold of the window. I see this happening when I try moving a window, and a window edge moves beyond the edge of the screen. When that happens, the window will jump to being all on the screen, and the cursor will still be where it was originally. This means the cursor is often nolonger over the window top bar. This could easily be related to the same code changes that cause the bug I just reported on windows jumping back to the screen edges. The bug report I mentioned in my last post. Text from that bug report: When a window is at the edge of the screen and is resized to full screen. When you later resize to nolonger being full screen, when you try to move the weindow to a new location away from the edge of teh screen the window will snap back to the edge of the screen it was originally against when if was first sized to full screen. It happens with all the programs I have tested it with, including, but not limited to, Firefox, xterm, and mplayer. I'm using Gnome Classic. I am also experiencing this in 12.04 Unity 3D in multiscreen mode. The edge resistance between the screens (which I love) is very annoyingly much weaker for mouse movements than for window movements – when it should be the same. The window edge will hang at the screen edge, while the mouse moves near it and beyond onto the other screen. Now I am still effectively dragging the window, even though the mouse is completely outside it. If I speed up mouse movement a lot, the window will then follow onto the next viewport, but far behind the mouse. John, this isn't a critical bug in compiz (there is no crash nor data loss). @thumper; Perhaps high then, given the number of duplicate bugs reported and people marked as 'also affects'? It *is* a very annoying bug that breaks the feeling of precision we are aiming for. This seems to be fixed in Quantal (and in Compiz trunk) as windows seem follow my mouse no matter what try (drag windows around, grab semi-maximised windows). After some digging and testing, the fix seems to be in revision 63 of lp:compiz-snap-plugin which was later merged to lp:compiz. As the plugin in Quantal is built from lp:compiz it has the working version included. Attached a diff of relevant changes (from rev63) which can be used to fix this bug in Precise if this bug were to be SRUed some point in the future (tested that locally and it seems to work fine). This was fixed under #872177 and is included in 12.10. So it was removed from the compiz source earlier this year. Reopened. The issue with dragging between workspaces is not fixed. But the problem with the snap plugin is fixed. Fix committed to lp:compiz/0.9.8 at revision 3423. scheduled for release in Compiz 0.9.8.8. Remember these are just the wall plugin fixes. The fix for the snap plugin is already in Compiz 0.9.8.0 and later. Sorry to confuse everyone with two fixes to one bug. Normally this should never happen. It's just that the first fix was never explicitly linked to the bug at all. Sigh. Still not fixed properly in 0.9.7. Simply backporting the fix from 0.9.9 is not enough. There's still a massive gap between the mouse pointer and window when its dragged between viewports. It seems something in the move plugin has to be backported to 0.9.7 as well. Not sure what. No matter how hard I move the window around I can't get the cursor to detach from the window with compiz in Quantal proposed. Any chances to have this fix backported to Precise Pangolin 12.04? If so, when can we expect it? This bug affects Precise Pangolin 12.04.4. It is possible to backport the fix to Precise? Quantal becomes unsupported in Abril 2014 but Precise has support until 2017.